Aware we'd chosen a cabin with more bad points than good, we hoped that somehow, just somehow, the dock we'd inherited as part of our chattels would be in better condition than it was. But no. It was rotten to the core. Hold it -- is it REALLY a year since last we graced the stage at the Cottage Life Spring Show to deliver cabin counsel to the wildly enthusiastic assembled audience? Fact of the matter is that yes, 12 months have indeed rolled by but blimey: it seems like 12 minutes. Time marches on, huh? We'll come back to ep two of Cabin Pressure in just a mo', but, before that, a little heads up about The Cottage Life Spring Show that runs from March 27 - March 29 at the International Centre in Mississauga. A combo of big names and big ideas, it's a compendium of pretty much everything you'll ever need to enhance your time at the cottage. From gazebos to log homes and from barbeques to strip wood canoes, The Spring Cottage Life Show is a juggernaut of retail opportunity, fascinating seminars (hosted by industry experts), celebrity chef cooking demos and design inspiration delivered by respected TV names. 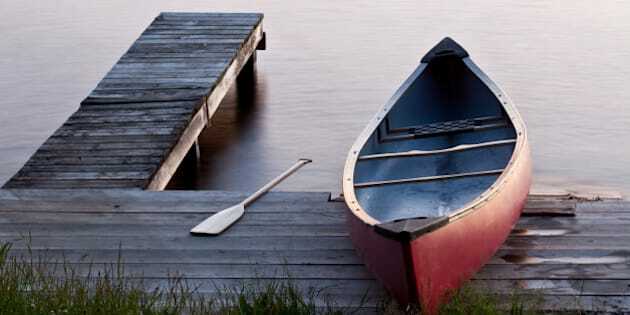 Whether you already own a lakeside escape, plan buying a cabin in the woods sometime soon or simply want to add a little cottage flair to your current urban or suburban nest, this show will send you into cottaging orbit. And this year it looks like being bigger than ever -- more than 33,000 attendees are expected, which makes it the world's largest cottage exhibition with an astonishing 550 plus exhibitors. Fans of Cottage Life television will be able to mix and mingle with some of their favourite hosts. Confirmed presenters include Andrew and Kevin from Brojects, celebrity realtor Rob Serediuk, host of What's For Sale? and those pesky Scots, Colin and Justin (we're dying to meet them. They seem such lovely boys -- so cheeky, but so talented) who be popping up at 1 p.m. on Saturday to help you feather your holiday nest and amplify its value via design. And worry not, the gobby Scots will be illustrating their chat with a full pictorial 'before and after' session to inspire and excite. Expect inspirational imagery from both seasons of Cabin Pressure. But anyway, where were we? Oh yes, our recent Haliburton purchase. And what's that maxim, you know: the one which property speculators everywhere spout ad infinitum? Hmm? 'Buyer beware'. Oh yes. Aware we'd chosen a cabin with more bad points than good, we hoped that somehow, just somehow, the dock we'd inherited as part of our chattels would be in better condition than it was. But no. It was rotten to the core. Dragged in and out of the water over the years it had expanded, contracted, cracked and peeled and was infected with both wet and dry rot. Not a lot going for it, really. So we bit the bullet and started from scratch. That said, we did actually salvage a third of the derelict pontoon and put it aside for future use. Let's just say it became an integral part of our guest bedroom. Okay, we turned it into a glorious and dreamy headboard. But more of that particular upcycling transformation in a couple of weeks time. Stay tuned. For today, we're focusing on the creation of that which turned out to be a celebration of floating dock joy. Being that we needed a new pontoon as part of our radical project conversion, we put out feelers. We spoke to several competent manufacturers but one, Interco Docks, stood head and shoulders above the rest. Based out of Peterborough, the convenience factor was an attraction, although it's fair to describe the company's outlook as far from local. Manufacturing, as they do, literally hundreds of floating rafts every year, their product has travelled the length of Canada. So our assignment was relatively convenient, being that they only had to deliver 90 km's (by flat bed truck) and then 'launch' the dock from the other side of the lake to our waiting shoreline. So what was our remit? Well, we needed somewhere to hook up the boat we intend buying ahead of summer 2015. And the dock needed to be sufficiently large so as to accommodate the sunbathing parties and late night revelry we intend hosting if the mercury's vertiginous ascent ever properly occurs. And so it came to pass we started a dialogue with Ben Burrett (his Dad set up Interco Docks 25 years past) to outline our ambition. Fun stuff aside, we stressed that we needed a low maintenance dock. An L-shaped configuration, measuring 50 feet long and 30 feet at its widest, was agreed upon at which point production commenced in earnest. Ben recommended outlining the dock in galvanized steel and, as a finishing detail, suggested sinking solar lights into the wood at various points around the perimeter. This detail alone gives the structure awesome presence during the evenings as the cute wee pin spots illuminate the platform and sparkle against Haliburton's inky skies. Importantly, the dock was manufactured in such a way that it can remain in the water all year round. The only proviso being that its stability chains and anchors are adjusted before ice forms so it can move freely to cope with expansion and subsequent contraction. While the company offers a maintenance contract -- if the prospect of disentanglement is too much to contemplate -- be assured: the process is so easy that we (with little experience) were able to undertake the operation with ease. Our new dock provides the perfect sightlines to the setting sun and, at the end of summer 2014, we enjoyed the spectacle on numerous occasions. Dressed, as you can see, with 'all weather' Hauser monochromatic furniture (visit their website for a host of inspiration) the vibe is very much casual dining/relaxing/sunbathing. We browsed the company's Toronto store, finally deciding on the set you see here, which we saw as a welcome relief from an abundance of generic faux resin furniture elsewhere. As our dock was being built, we also started work on the first stage of the cabin reno' -- that being it's a 20 foot lift (a precise mechanical operation conducted by Almaguin Building Movers) to facilitate a basement dig and the creation of a brand new laundry, TV room and bedroom. See the 'jacked up' levitation and the realization of our dockside dreams in more detail during Sunday's nail biting episode of Cabin Pressure! Now all that remains is to wait for summer 2015 to unravel. As it stands, our dock is concealed below several feet of snow. As anyone in cottage country will attest, the weather has been unforgiving -- nay, relentless. In the meantime we can only dream of the fun that lies ahead, spread eagled, as warmer climes make our cabin transformation worthwhile. To help us through the remainder of these colder climes, however, we'll be battling a path to the Cottage Life Show when the exhibition's massive portals are thrown open. Perhaps we'll see you there! 'Colin and Justin's Cabin Pressure' airs Sundays at 9pm on Cottage Life. The television network is currently in free preview.